Join the discussion on our forums! Come discuss Nozari over in our dedicated Nozari discussion topic. 2. This card doesn't have "no duplicates" requirement. 3. This card is friggin' standart, Reno isn't. 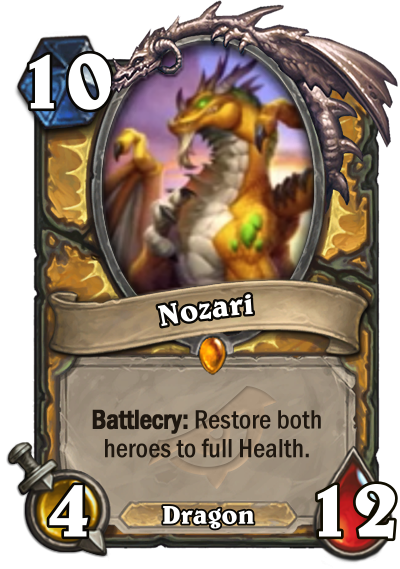 Plus, there wasn't a High Priest Thekal back then for us to have x2 health, this card lets you have a full-heal at its complete potential. So comparing this to Reno is pointless. This is something that I came up with when I noticed I had the old Crystalsmith, whom I hadn't even ever used till now. It's been a fairly efficient deck. Just as I've wrote in its description, I had been swarmed by Vargoth Priests, and assuming how much trouble it had against them, it's likely not the most adept in dealing with those Big Priest, Handlock, Egg and such decks. It has, however, proven quite efficient against a lot of aggro variant decks, not perfect, but definitely gets the job done. Rebuke and its other control elements give it some hope against managing to beat combo and control decks into the later game, or ones that have had really, really lucky starts, and it's higher tempo through Shield Bots, Hydrologists, 1 mana Hero Powers and more, tend to just give it enough tempo to compete with aggro, tempo and midrange. Overall, not a top tier deck, but a pretty decent one nonetheless, and definitely a fun one, at least for myself so far. So, this plus Reno, plus the Forbidden Crystalsmith combo, and, well, we got a Survaldin, or would it be an Immortaldin? Heck, we can toss in Genn, too, if we want to make it, well, an even deck. Heck, even costs are most of the Pally's strongest cards too, such as a plethora of legendaries from Tirion to Glass Knight and Tarim, as well as neutrals support like ol Lich King. And we also got Ivory and Murloc Knights, Keepers of Uldaman and Zandalari Templars, Truesilvers and Argent Lances, as well as A Light in the Darkness and Enter the Coliseum for even more control past the Pyro/Consecrate Equality. Tree of Life barely saw any play. is 1 mana more for a 4/12 in paladin enough to see play? I Don't think so, since at turn 10 you are ether dead or already stabilized. While I agree completely, he works like a Reno Jackson, if you play Thekal first. That is about the only thing I see that is beneficial. Stat line is too low for 10 mana (unless you are generating a card every turn from the emerald dream). Maybe if he only healed you, or if healing both gave everything in your hand +1/+1 each turn as well. I think he will see play early but will get replaced soon enough for not doing enough. Just discover Auchenai Soulpriest from somewhere… For the memes!